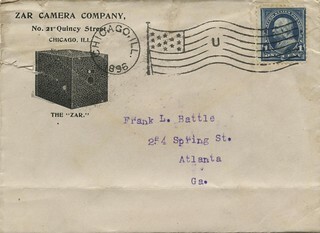 The Zar Camera Company was founded in 1896 in Chicago. Originally it should support production of Western Camera Manufacturing Co.'s Cyclone cameras, but soon it introduced an own camera, the Pocket Zar, a box camera for special 2×2" glass plates. At that time box cameras of other makers were made of wood. Zar used cardboard instead, thus making the first cheap consumer camera based on the extensive use of cheap material. The factory reached the necessary precision to turn a meniscus lens, a shutter of simplest kind and cardboard into a quite well-working plate camera. A package with 12 Pocket Zar glass plates cost 20 cents and the camera itself only 1 Dollar - in 1896, four years before the advent of Kodak's 1-Dollar rollfilm cardboard camera for 15-cent 6-shot filmrolls! Thus Kodak's revolution was not the price of its cameras and films, it was the use of daylight loading rollfilm cartridges for such cheap cameras. In 1897 Western Camera took over control of Zar and continued to produce the Pocket Zar for a while. 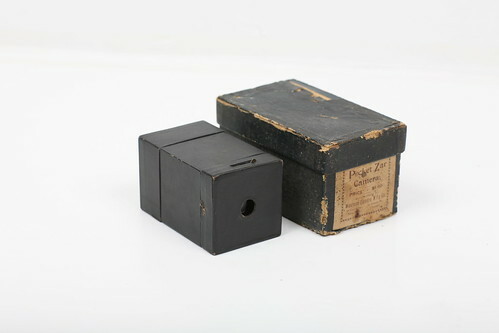 The nearby Yale company launched a similar simple box camera for plates.